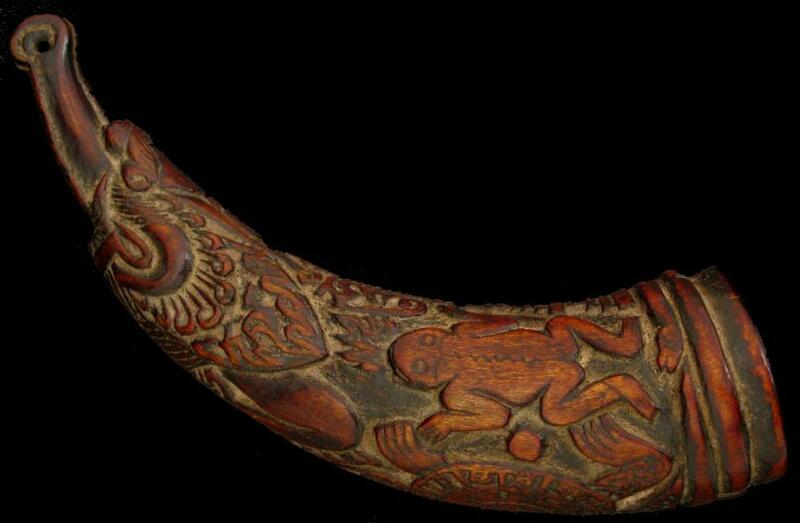 Carved horns such as this were used to dispense seeds during Tibetan monastic offering rituals. The horn was used to hold seeds – typically mustard seeds which grow in the lower reaches of the Himalayas – for offering into the fire as part of purifying and exorcising fire-offering rituals. makara with an elongated snout beneath which an aperture permits the emission of the seeds. The horn was shaken to release the seeds into the fire which was typically contained within a prescribed triangular fire-offering brazier, whilst the practitioner recited cleansing and exorcising mantras. lantsa script, a frog, a scorpion and a stupa. Two columns of additional lantsa script are alongside the stupa, to the top of the horn. The open part of the horn retains the original wooden plug, which has been engraved with a double triangle emblem.